Remove the PCIe riser from the server. See Remove the PCIe Riser From PCIe Slots 3 and 4. Remove the PCIe card from the riser. Hold the riser in one hand and use your other hand to carefully remove the PCIe card connector from the riser. Disconnect the rear bracket attached to the PCIe card from the rear of the PCIe riser. Place the PCIe card on an antistatic mat. Caution - Whenever you remove a PCIe card, you should replace it with another PCIe card or a PCIe filler panel. 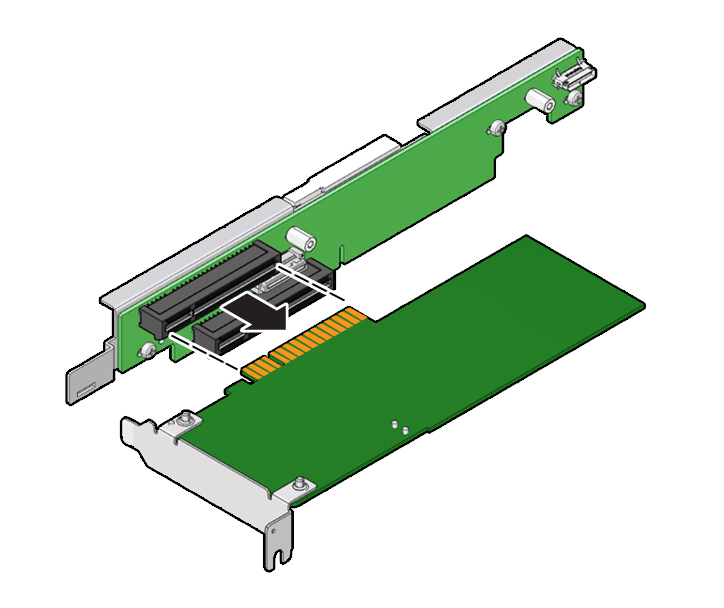 Installing PCIe filler panels in vacant PCIe slots helps reduce the level of electromagnetic interference (EMI) emitted by the server. See Remove and Install Filler Panels.